One of our favorite recent incense collaborations was with Cobra Rock - Marfa, Texas based hand crafted leather boot company. We worked with the team at Cobra Rock to create an incense blend that would evoke the feel of the Texas desert landscape, a scent that would compliment the smell of leather and cactus blossoms. After several months of testing and revising three different blends, we came up with the Chispa blend made with a base of Palo Santo, Cardamom, Benzoin and Sandalwood. We hand rolled the incense cones and sent them off to Marfa for packaging. Cobra Rock designed and produced a gorgeous hand-stamped leather pouch to securely hold the cones until time it's time to light them up. 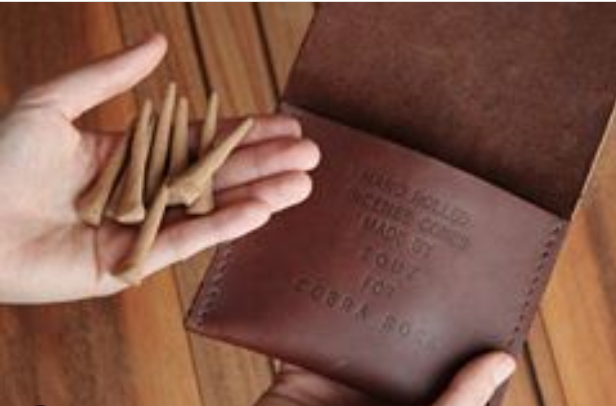 Learn more about Cobra Rock and their wonderful leather goods.